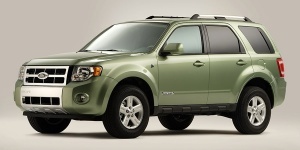 The Ford Escape receives only minor changes for 2010. An Integrated Blind Spot Mirror, MyKey programmable vehicle key, Rear View Camera System, and Active Park Assist are now available, and the Ford Escape also features hands-free SYNC with Traffic, Directions & Information. All the features improve safety and reduce driver distractions. Find the used Ford Escape of your choice from a dealer in your area. Search our used car listings now.